GET RID OF DRY AND FLAKY SKIN - Men and Women who suffer from dry facial skin sometimes think there is no remedy that can help. This daily moisturizing cream will give you that extra hydration you need to have a smooth and moisture filled face without embarrassing dry skin! BEST INGREDIENTS INSIDE - We are the only cream on the market to combine 6 Vitamins (C, E,B5,F,H,A) green lotus extract, plums, along with niacinamide and adenosine which help reduce the appearance of fine lines and wrinkles, and brightens skin for an even, glowing skin tone that lasts for 24 hours. 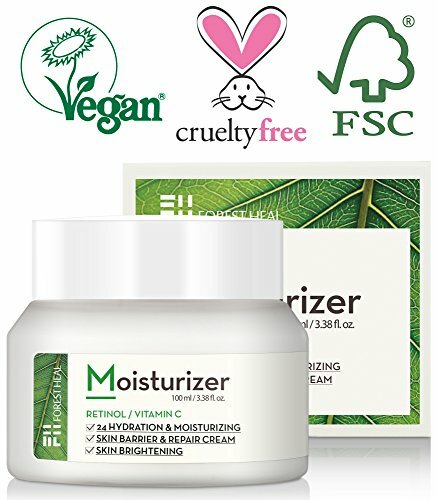 QUICK ABSORBING AND NON GREASY - Tired of other anti-aging creams that make your face feel all greasy, and/or heavy and thick? This cream is quick absorbing and is light. It does not cause your face to sweat nor produce oils in overdrive. Can be placed over the Forest Heal Vitamin C Serum if you have that too! 99 PROBLEMS? Our customers use this cream to help with seborrheic dermatitis, anti aging, anti wrinkle, skin tightening, skin elasticity, wrinkle control, fine lines, scars, skin texture, stretch marks, under eye bags, sun damage, scars, skin texture and more. All of this without harmful fragrances, dyes or parabens. MORE BANG FOR YOUR BUCK - Many of the other antiaging care products and moisturizers only give you 1-1.7 ounces of product. We have almost twice as much with 3.38 oz of travel size beauty skincare that will pass TSA. If you have any questions about this product by Forest Heal, contact us by completing and submitting the form below. If you are looking for a specif part number, please include it with your message. L'Oréal Paris Age Perfect Hydra Nutrition Day/Night Cream, 1.7 oz.